In 1927, William Somerville conceived the idea of a tree cathedral of Norfolk pine trees. Today the venue is best known for the Perth International Arts Festival's annual Lotterywest Film Season from November through to April. 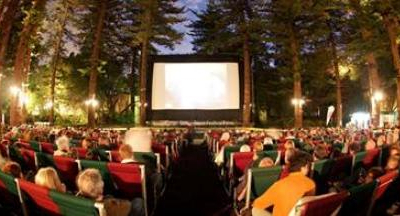 Under the majestic tree canopy, and with seats for 900 patrons and 300 seated on the ground, there is no better venue to enjoy a film on a warm Perth evening. Picnicking has become a traditional part of the pre-film entertainment and is a great way to soak up the ambience. The Somerville Auditorium is licensed with a comprehensive bar, has delicious dinner options, snacks, ice-creams and coffee. The venue is also renowned for the annual In the Pines music festival organised by local community radio station RTR FM. Tickets and voucher packs are available at the venue, online from Perth Festival or by calling (08) 6488 5555. The gates open at 6pm, with the film starting at 8pm. From March 4 the film starts at 7.30pm. To purchase your tickets in-person, please visit the Octagon Theatre Box Office on Friday between 12pm - 4pm, or Saturday between 10am - 2pm. Entrance is first come, first served. Saving seats for other patrons does not guarantee them entry as they must hold a valid ticket for that evening’s session. Failure to do this will mean that when the Somerville is sold out, they will not be able to enter. Film screenings will usually go ahead in the event of rain. Any cancellations will be announced by 7pm on the evening of screening via the Festival's website and on Facebook/ Twitter. If after the venue opens a screening is cancelled due to rain, a voucher will be issued for another night that week. There are a variety of food and beverage options available in the UWA Somerville Auditorium during the LotteryWest Film Season. You can bring a picnic, or purchase food and drink from one of the on-site food stalls. There is a bar serving a variety of beer, wine, spirits, soft drink, tea, coffee and snacks. View the bar menu here. Charlie's Pizza also caters to the venue with a selection of authentic wood-fire pizzas. Their menu can be viewed here. For the first time it is now possible to book this historic tree cathedral for weddings and private events. A beautiful, clear-roofed structure will sit amongst the soaring pines, allowing up to 250 guests to dine in Perth's most exclusive venue. Contact Ultimo Catering and Events for more information. Click here for help planning your journey to the Crawley Campus of the University of Western Australia. UWA Somerville is accessible by wheelchair, with level access to venue from paved entry. Venue flooring is a combination of paving and compact dirt. There is no audio loop available for performances in UWA Somerville Auditorium. Wheelchair seating is available on the centre aisle in the back row of the front block. Two seats have been reserved on either side of these spaces for accompanying patrons. Wheelchair seating is also available on the side of the auditorium. Please speak to venue staff on arrival if you require assistance. Hard backed plastic chairs are available for patrons who are unable to sit in the deckchairs. These chairs may be used in the wheelchair areas only. Please speak to a staff member if you require a chair. A universal access toilet is located in the foyer of Octagon Theatre. Additional access toilets are located in the Music building. Pick up and set down is available in Car Park 1. A bay is allocated for drop off on the right-hand side of the car park. Toilets are located in the nearby Octagon Theatre (including a university access toilet) and the School of Music. A pass-out is issued to enable you to re-enter the venue. Call (08) 6488 7092 in office hours. The University of Western Australia is smoke free. Smoking is not allowed anywhere on campus.